Yes, I'm happy that Barack Obama is now President of the United States of America. I sort of accidently arranged a celebratory lunch (I brought vegan hot dogs- very popular) at the office. Loads of people joined in bringing food and decorations- including this hat for me and a matching one for the other American in the office. 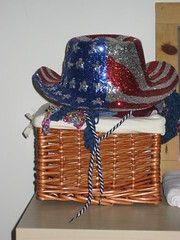 I did wear the hat home (it wouldn't fit in my bag). As I was crossing to the bus stop, I notice a student-ish guy on his bike was staring at me. "Happy Obama Day!" I shouted, and he shouted back "Happy Obama Day!"